Despite the fall of some of it's biggest rookies, 1995 Bowman's Best Baseball remains one of the best and most desirable sets of the mid-1990s. The 1995 Bowman's Best Baseball checklist is a little bit strange in that it's composed of three different subsets, each with their own numbering. Blue cards have rookies and prospects, reds are for veterans and Mirror Image cards pair a prospect and a veteran. Blue and red cards are nearly identical save for a colored stripe on the front. Both have a large team logo with a color band underneath differentiating the future from the present. Mirror Image cards are horizontal. The prospect is on the left. They are paired with a veteran sharing similar abilities. At least they were perceived to have similar skills. Historically, nobody is going to compare Todd Greene to Ken Griffey Jr. or Ruben Rivera to Frank Thomas. 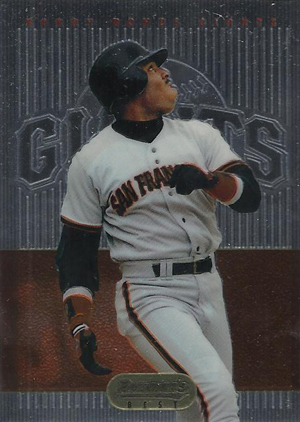 It's worth noting that the Mirror Image card pairing Juan Gonzalez and Juan Lebron actually pictures Carlos Beltran. This same wrong-photo error was repeated in 1995 Topps Traded Baseball. Lebron's card has Beltran on it and the Beltran card has Lebron. At one point, the 1995 Bowman's Best Baseball Andruw Jones was one of the most desirable modern cards in the hobby. While his career has been decent, he failed to live up to the tremendous hype surrounding him. As a result, the rookie is now only worth a fraction of what it once sold for. 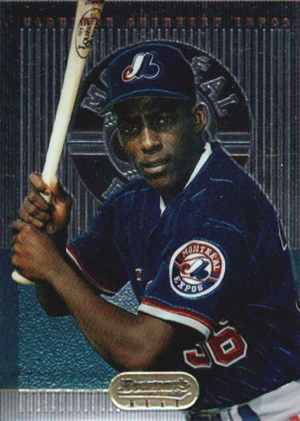 Similarly, the Vladimir Guerrero used to be a very strong seller. It too has softened somewhat, but not to the extent of Jones. Other rookies in 1995 Bowman's Best Baseball include Scott Rolen, Chris Carpenter, Bartolo Colon, Bobby Abreu and Hideo Nomo. The only inserts found in packs are Refractors, which combine to fall approximately four per box. Red and Blue Refractors have the familiar rainbow background collectors are familiar with today. Mirror Image Refractors take a different approach, using diffraction foil backgrounds. The result looks like a bunch of stripes throughout the card. Refractors are noted on the back, although veteran variations can be found without the notation as well. Jumbo Refractors were distributed in specially marked Topps retail boxes. The cards look identical to regular Refractors save for their size. They measure 4 1/4" by 5 3/4". 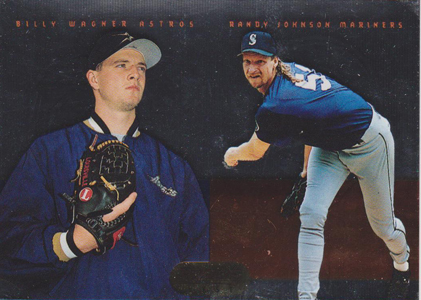 1995 Bowman's Best Baseball hobby boxes come with 24 packs of seven cards. Retail boxes have 20 packs with five cards each. 15 cards. Card 5 is an uncorrected error. Carlos Beltran is pictured, not Juan Lebron. 12 Todd Greene, Ken Griffey Jr.
10 cards. Exclusive box topper to retail boxes. Cards measure 4 1/4" by 5 3/4". AM I ABLE TO LOCATE this card on your site. Diana Faber � Are you looking for some sort of information on it?